Located just inside the Interstate 495 belt in Marlborough, Jericho Hill served area skiers for over half a century. The area remains open to the public for hiking and sledding today. 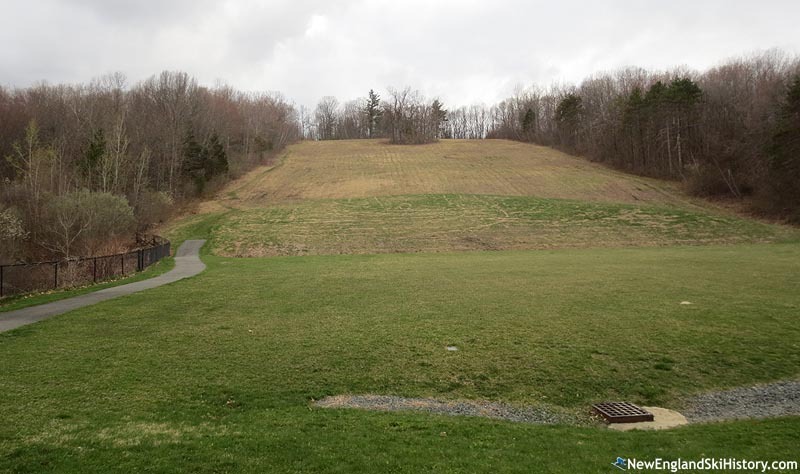 According to the New England Lost Ski Areas Project, Jericho's Frank Carbone bulldozed a ski slope into the east face of 550 foot Jericho Hill in Marlborough in 1939. The Jericho Ski Club was incorporated in the fall of 1944 with co-founder Norman LeDuc as its President. In addition to sporting a race team, the ski club owned and operated the rope-tow serviced Jericho Hill ski area. Jericho was considered cutting edge as the 1950-51 season approached. The main slope and rope tow were illuminated with 20,000 watts for night skiing. In addition, that December the ski club dug a reservoir and rolled out a 20 nozzle snowmaking operation. At its full build out, the ski area featured three slopes (two of which were separated by only a few trees and utility poles), surrounded by two perimeter trails (Rim Run and Frank's Run). Two rope tows provided uphill transportation for decades. The area tended to be open at night during the week and during the day on weekends and holiday periods. The Jericho Ski Club was dissolved in the fall of 1986. Around this time, the City of Marlborough acquired the ski area and put the Parks and Recreation Department in charge of it. At some point during the 1980s, the T-Bar from Boxboro Hills ski area was likely relocated to Jericho, possibly replacing one of the rope tows. Unfortunately for Jericho, poor winters and a lack of funds began to take its toll. The winter of 1993 was particularly rough, as the T-Bar was out of commission during Presidents' week. 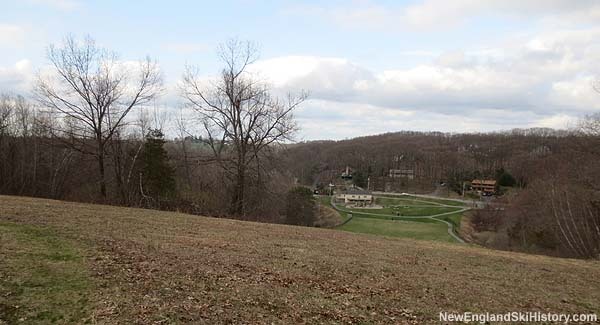 While the town hoped to sell or lease the ski area, it could not strike a deal. Instead, its operations became a perennial question. While Mayor McGorty was able to keep the area open for part of the 1997-98 season, the city announced Jericho's closure in the fall of 1998. In the fall of 2001, the City of Marlborough was awarded a quarter million dollar state grant to convert the abandoned ski area into a park. In subsequent years, a basketball court and playground were constructed, while the slopes were redeveloped for hiking and sledding. The facility is now known as the Joseph A. Ferrecchia Park at Jericho Hill. "In 1992 I turned 16 and got my first car - I remember one weekend it snowed 6" and was SO psyched to drive by myself to Jericho for my first "no friends on a powder day" trip. Ticket was something like $6. I remember there was the main slopes and a couple narrow trails at the edges. They never seemed to open an expert run trail on the other side of the rope tow. Great place to learn how to ski! " "I grew up walking distance from Jericho, and spent countless days and nights skiing and sledding there. Some nights it was just the neighborhood kids skiing our private hill. The memories are endless. As late as my mid20s we would still go sledding or tubing by moonlight with a barrel fire going at the top, case of beer and a bottle of Rumplemintze keeping us smiling. The city needs to fix the drainage ditch at the bottom where they filled in for the soccer field. Someone will break their back." "My father work ski patrol here ( Frank Allen) according to my mother I took my first steps At Jericho. But what i really remember it the frozen infra- red pizza at the snack bar. No pizza has ever tasted so good !"